In a recent CIO Magazine survey on the Top 10 CIO Issues, business alignment, cost control, governance (both IT and regulatory), plus marketing IT's value were all listed. Increasingly, today's IT leaders need to manage and prioritise investments and actions, improve control over IT's contribution to the business from top to bottom, and visibly demonstrate IT's business value. Hear about the industry's first systematic approach. 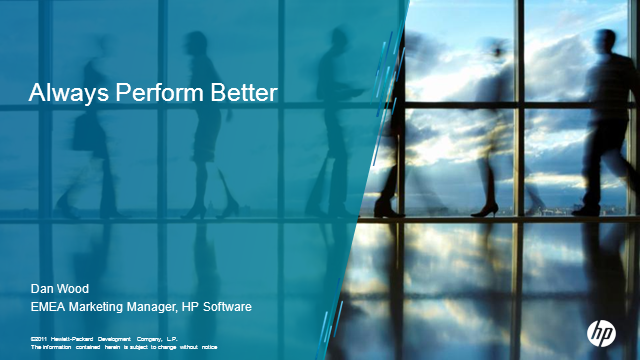 The HP IT Performance Suite provides a systematic approach to sensing and measuring the entire IT-controlled landscape into a consolidated view for IT leaders. It spans every IT proces - starting with strategy, planning, and governance and extending across the management of applications, operations, information, and security.